You can fine tune the fills of your AutoShapes (Shapes, in 2007) by applying a variety of surface materials and lighting treatments. The differences are subtle but can impart a more professional result and create a realistic 3D look. 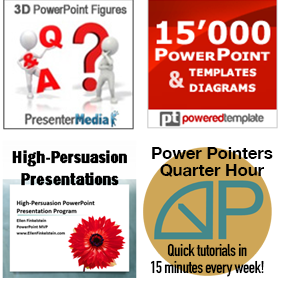 PowerPoint 2007 has added many additional material and lighting settings. 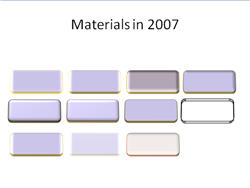 I’ve covered PowerPoint 2007 separately below. In PowerPoint 2002 & 2003, you have a few options for changing the surface characteristics of an AutoShape by choosing one of 4 surfaces. You can also change the direction of the light and its brightness. These settings are all on the 3D Settings toolbar. Insert an AutoShape on a slide. Even better, insert several identical AutoShapes so that you can try out variations and compare them. Select one of the AutoShapes. Click the 3-D Style button on the Drawing toolbar. The 3-D Style menu pops up. For this exercise, choose the upper-left button, called 3-D Style 1. You need to choose a 3D style to use these features. Click 3-D Settings at the bottom to open the 3-D Settings toolbar. Click the Surface button to open the Surface menu. Click the Lighting button on the 3-D Setttings toolbar. Click the Lighting button again and choose Bright, Normal, or Dim. Apply the 3D, surface, and lighting effects to other AutoShapes. Insert a Shape on a slide. Even better, insert several identical AutoShapes so that you can try out variations and compare them. 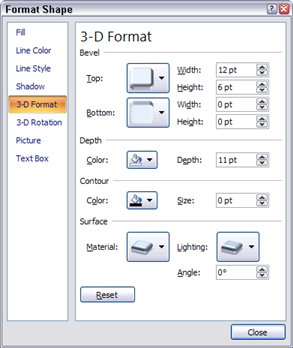 Choose Drawing Tools Format tab>Shape Styles group >Dialog box launcher button (Format Shape dialog box)>3-D Rotation. Click the Presets drop-down list. Choose the Perspective Above rotation, or another rotation that you like. This is equivalent to choosing a 3-D Style in PowerPoint 2003. Click the 3-D Format category. In the Depth section, enter a depth for the object, to make it 3D. In this example, I set the depth to 11 points. 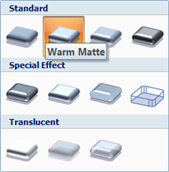 In the Surface section, click the Material drop-down list, and choose a material. You can see that there are many more options than in PowerPoint 2003. Of special interest are the Special Effect and Translucent materials. Click the Lighting drop-down list and choose a lighting option. Note that lighting affects the entire slide, not just the selected object. Tip: For a description of the various materials and lights, click the ? at the top of the Format Shape dialog box. Try out other settings on other shapes, and then click Close. 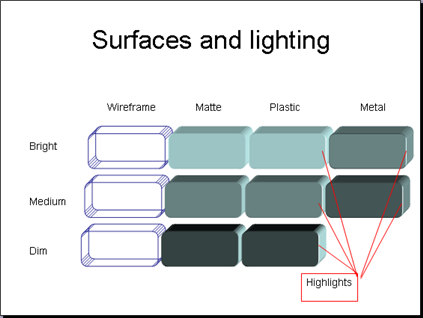 This slide displays all of the materials, with assorted lighting settings.